I am honored to be a participant in the I.M.A.G.I.N.E PEACE NOW! project, which is the brainchild of the brilliant sculptor/metalsmith Boris Bally. The I.M.A.G.I.N.E acronym stands in for "the Innovative Merger of Art & Guns to Inspire New Expressions." 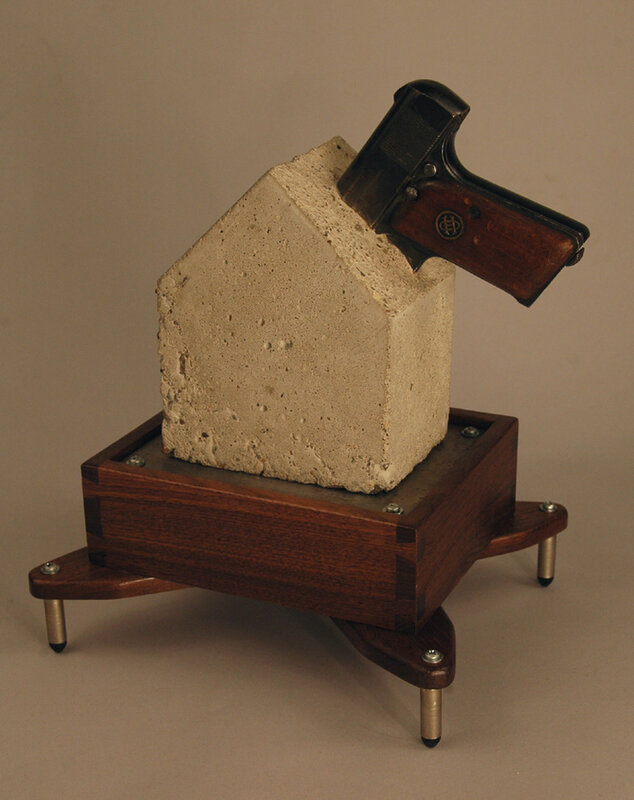 The project includes nationally and internationally recognized artists who transformed disabled guns into compelling art objects. Over 30 people in the United States are killed every day with guns. Over 150 people are treated for gun-related injuries on a daily basis. This topic is one that needs much more attention from artists and the general public. The artworks were shown at the Society for Arts and Crafts in Boston, and they will be shown in a number of other venues. The project also included a book. The sculpture pictured above is This All Goes Down Together. The piece is 13"h x 17"w x 7"d. The base is made out of figured maple and steel. The boat itself is made from bone, white plastic, holly wood, and a material known as vegetable ivory. This All Goes Down Together is about the unified fate of Earth's inhabitants in the case of environmental collapse. Considering the intended content of the piece, it made sense to use bone (animal), holly wood (vegetable), and plastic (derived from minerals). The fact that it is difficult to discern which part of the boat is made from what material underscores the inseparability of the fates of Earth's denizens. At a recent solo exhibition, I was asked a number of questions about vegetable ivory. I discovered the material several years back when I was looking to carve some very small scale objects. Vegetable ivory is an amazing alternative to bone. Anyone who has power-carved or sanded bone knows the pungent scent that accompanies the process (it smells a lot like having a tooth drilled at the dentist). Vegetable ivory is actually a nut (a tagua nut to be exact), so when it is power-carved it smells like toasted almonds, it's actually kind of nice to smell. Tagua nuts are sustainably harvested from ivory palm trees in South America and their harvest provides money for local economies. It is so interesting to make a cut into one of the scaly brown nuts to reveal its dense, creamy, off-white center. The material has unbelievably crisp machinability and polishes beautifully. if you are itching to create a series of netsuke or homages to Charles LeDray, give vegetable ivory a try.